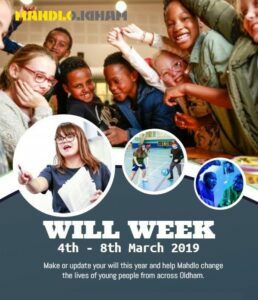 We are once again pleased to be supporting Mahdlo – Oldham’s annual ‘Will Week’ this week. We are working with Mahdlo to provide members of the public with an opportunity to access our Will preparation services, whilst at the same time raising funds to support Mahdlo. The scheme is running from the 4th to the 8th March inclusive. In return for a set donation to Mahdlo we will prepare your simple Wills. A Single Will (£100) or Mirror Wills (£150). We still have a few appointments left so be quick and call us to book in on 0161 624 5614 quoting ‘Mahdlo Will Week’.